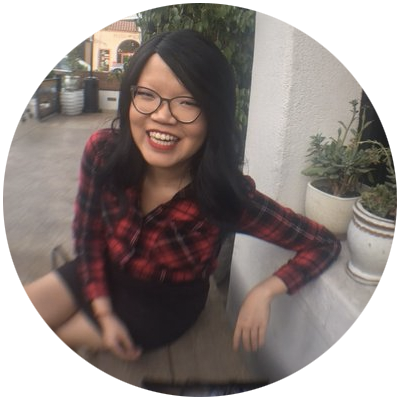 Earlier this year, I'd vlogged about the one fictional world I would want to visit, and if you know me, I think you'll be able to predict the answer before I could begin to give it to you. Growing up, I can't remember a year where I wasn't reading (or re-reading) one of the Harry Potter books or going to see one of the films with my friends. I still remember being terribly upset after Na spoiled the end of Chamber of Secrets for me (she swears she doesn't remember doing this), as well as entire days spent on the couch next to Na as we read each book the day it was released (Mom would buy two copies so we could read at the same time, then we'd donate one to the library after we'd finished). 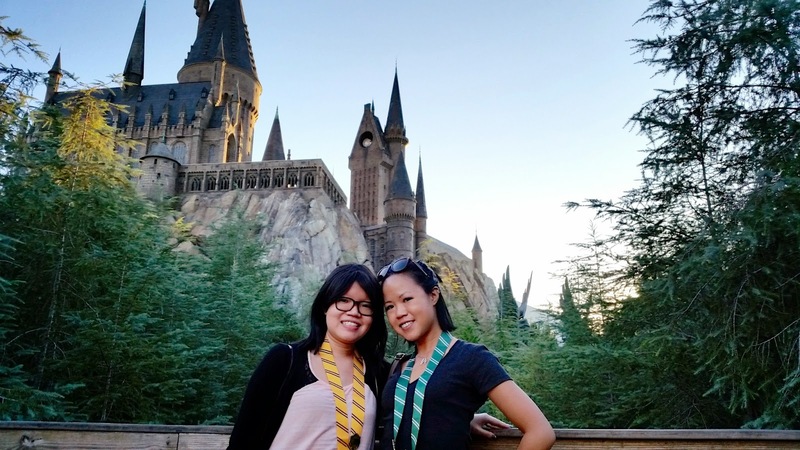 If you follow me on Instagram, you'll know that Na and I have finally fulfilled our childhood dreams and spent a few days in sunny Orlando, Florida at Universal Studios, where the Wizarding World of Harry Potter theme parks were everything we'd dreamed of (and more!). 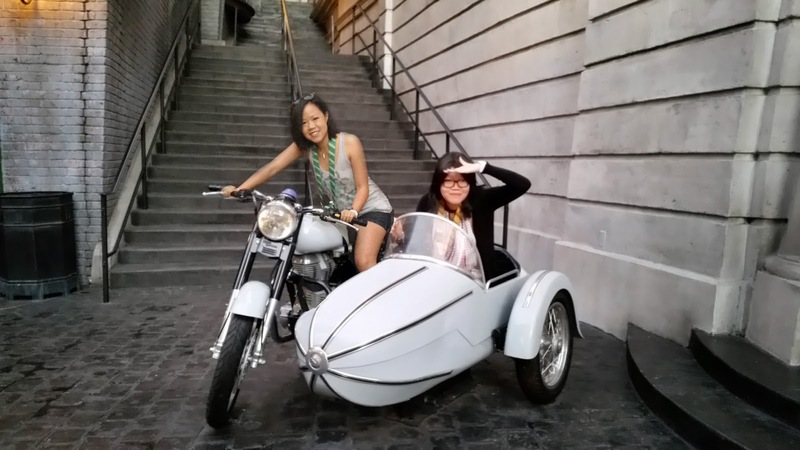 I'll try not to make this too much of a tourism ad for Universal Studios--which, Harry Potter aside, was lots of fun--but if you grew up a Potterhead like I did, this is an absolute must. We didn't do a lot of research beforehand, mainly because I didn't have time and also because I wanted to be surprised. After a very confusing first morning of trying to figure out which park we were supposed to be at for our Three Broomsticks breakfast reservation (they don't make it easy to figure out), we walked through Universal's Island of Adventures toward Hogsmeade with a group of other breakfast-goers to begin the trip. The first thing we did was order pumpkin juice (which Andrea had sworn by--and her glowing review did not disappoint) with our breakfasts (the wizard at the front door told us the pancakes were their specialty, though we didn't think they were as excellent as they were talked up to be). The first thing you notice about the Three Broomsticks is Universal's commitment to all of the little details. Every corner of Hogsmeade, Hogwarts, and Diagon Alley screamed "you are literally in Harry's world"--from the music played over the loudspeakers to the quirky signs hung by doorways to the moving "wanted" posters on announcement boards and the alley leading down to Knockturn Alley. There was even a phone booth outside of "King's Cross" where you can dial to access the Ministry of Magic, and a large stone dragon atop Gringotts that breathed real fire every 10 or 15 minutes. Neither Na nor I could justify spending the $50 on an interactive wand, but it was fun watching all of the other park visitors--especially the kids!--wave them at the windows of the fake shops as items magically came to life. 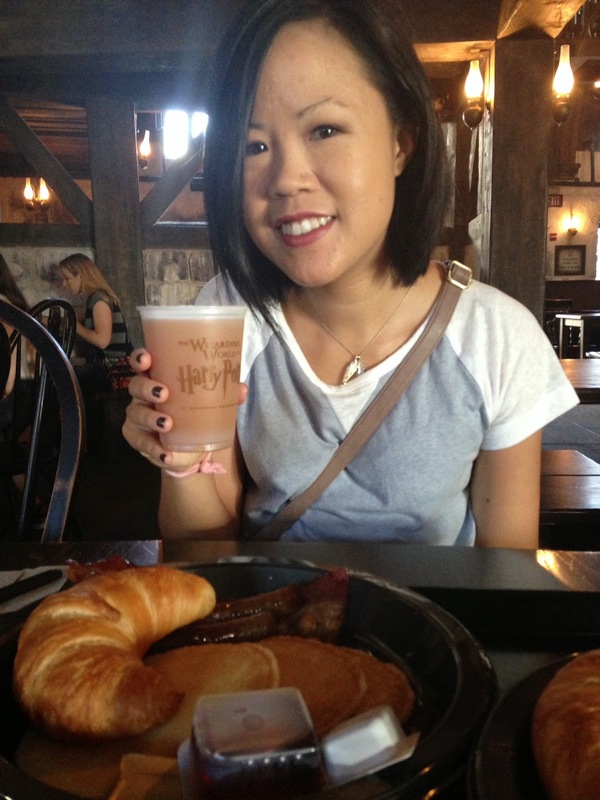 Our second morning began with breakfast at the Leaky Cauldron in Diagon Alley, which had pretty much the same menu. Actually--back up a couple hours. Our second morning began with a commitment to utilize our early park admission perk and head straight to the parks' newest ride, Escape from Gringotts. More on that later--back to the breakfast: it was delicious, though I preferred the atmosphere inside the Three Broomsticks (which Na and I also had dinner at that night). 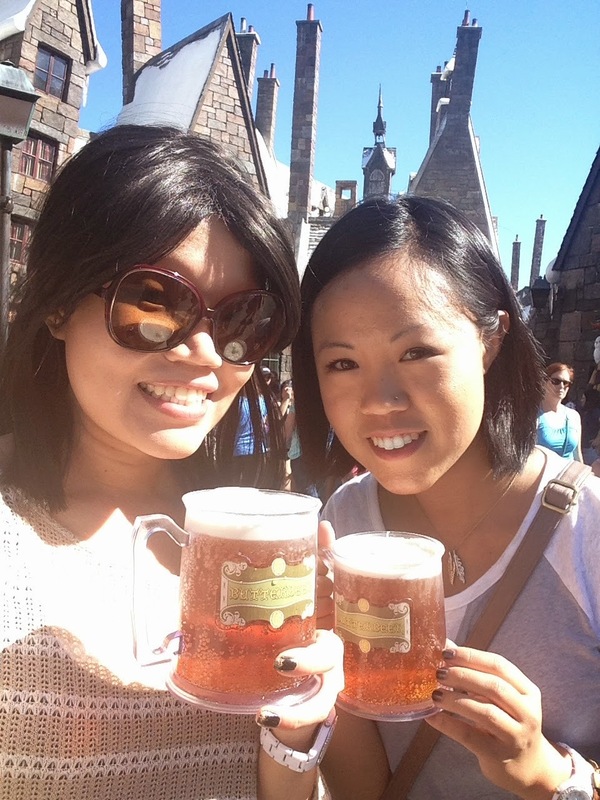 The first two things people ask about when they hear about our trip: the rides and Butterbeer. First, the Butterbeer: as delicious as expected. In Hogsmeade, there were two carts that served visitors, and you could also order Butterbeer (in two forms: regular or frozen, which was like drinking a slushie) inside a couple of the shops. 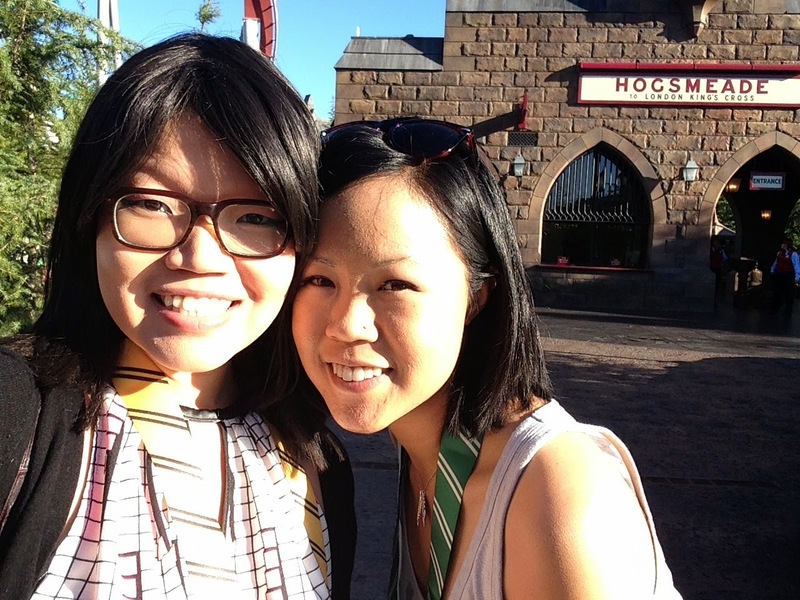 We drank a lot of Butterbeer in the three days we spent at the parks, but the hidden surprise was discovering Butterbeer ice cream at Florean Fortescue's in Diagon Alley. We had that twice! The Forbidden Journey (times ridden: 3; longest wait: 1 hour) -- I enjoyed waiting in the line for this ride as much as the ride itself. The hour or so we spent queuing for this the first day felt like the ride itself as you went through the castle, passing through halls of talking portraits, Dumbledore's office, classrooms, the Gryffindor common room, etc. The ride itself was fun, with all of the tilting and twirling, and it was one of the few Universal rides that didn't require 3D glasses (which are hard to wear over my regular glasses). Flight of the Hippogriff (times ridden: 1; longest wait: 30 minutes) -- From the outside, it looks like it'd be a Thunder Mountain-esque rollercoaster experience. After about a half hour wait outside, we got on the ride and it was...less than a minute long. You only go around the track once. It was disappointing, but we got to pass by Hagrid's Hut in the queue, so I guess there's that. Escape from Gringotts (times ridden: 2; longest wait: 1 1/2 hours) -- This ride is known for having an absurdly long wait--mainly because it's also known for breaking down. A lot. The second morning we were at Universal, we got to the park at 7 a.m. for early admission and headed straight to the ride. By the time we got into the line, the wait time was already 45 minutes... there wasn't a lot to look at while queuing outside, but once you entered Gringotts itself, it felt more magical. There were animatronic goblins working at the desks, and underground there were moving shadows behind the office doors. Right before Na and I were about to pick up our 3D glasses and head toward the part of the line that would take us onto the ride, it broke down and we were stuck waiting about 20 minutes. The staffer in our area tried to make the wait fun for the kids and played Harry Potter trivia games with people, which was a nice touch. She also said that the longest downtime the ride has had was six hours. That's ridiculous! The line for this ride can get kind of messy, so it wasn't the best experience, but the ride itself was really cool. I suppose if it didn't break down so often, it'd be much more of a hit. The Hogwarts Express (times ridden: 4; longest wait: 1 1/2 hours) -- You can only take the Hogwarts Express if you have admission to both parks. Waiting in line at Hogsmeade to go to Diagon Alley is not fun or interesting at all, but the line inside King's Cross to go to Hogsmeade is alright. You really do feel like you're in a train station. There's even a small shop to buy British snacks halfway through the queue, and the special effect that makes it look like you're running through the wall between Platforms 9 and 10 is worth the wait. The train ride itself was neat and made it look as if you were really going through London and the countryside--owls, Dementors, the Knight Bus, and all. The shadows and voices inside the train were cool too (this is hard to explain, but trust me--it all feels real). We also spent time in the rest of the Universal parks, which were not as crowded as we expected as the weekend neared. Short summary: the queues for the Spiderman and Men in Black rides felt shorter than they were, the wait for the Minion ride was painful, but the ride itself was pretty fun. All of the rides we went on were pretty enjoyable, actually, but everything also required 3D glasses. Our trip ended with a shortened day on Saturday to prepare for ridiculously early flights the next morning, but not before realizing there was a Harry Potter marathon on ABC Family--so we ordered pizza, watched the films, and ate our chocolate cauldron cake from Honeyduke's before bed. Honestly? I can't think of a more fun vacation in recent memory.